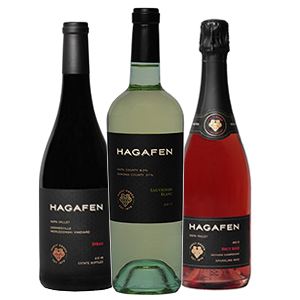 We ship two-four bottles of Hagafen Cellars wine four times a year to our members. Shipments are on or around the beginning of February, May, August, and November. The Average cost is $90.00-$125.00 per shipment plus shipping and tax. The cost of the wine reflects a 15% discount off the suggested retail price. Local residents can pick up the Wine Club selections at the winery. Reorders of Club selections are also discounted at the 15% rate for one month following release. Reorders for 12 bottles or more are discounted an additional 5% (a total discount of 20%). We hope you survived winter and, now that spring has sprung, are looking forward to some warmer weather! Here at Hagafen the vines are budding, the flowers are blooming and your latest Hagafen Wine Club selection is being prepared! Please read the following closely! As always, you have the option to add or change a bottle (or more) of a selection of your favorite fabulous Hagafen wines. If you would like to change your selection please do so by Wednesday, May 1st. If you do not make a selection, no worries, we will send you our great standard club selection. It is always important that we have your correct shipping address. Please take the time to log into your account to verify we have all of your information correct; delivery address, credit card, phone number, email, etc. Please remember there needs to be a person over the age of 21 able to sign for the wine delivery. Any costs associated with re-delivery, change of delivery date, or address changes once wines are en route are added to your account. Please make any corrections by Wednesday, May 1st. If you have any questions please don't hesitate to call 707-252-0781 ext 102 or email wineclubs@hagafen.com. Please make any corrections by Wednesday, May 1st.